I came across this strange spider the other day as I walked through the back gate. 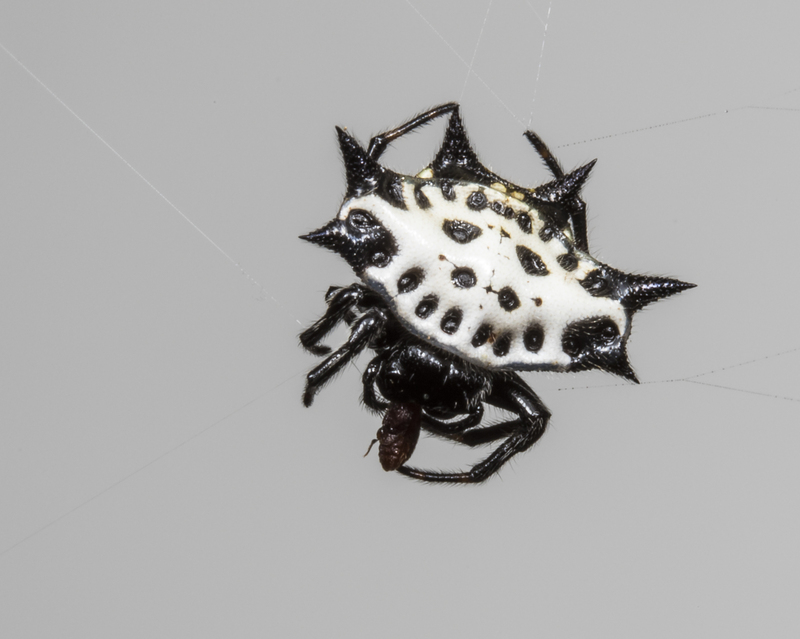 I noticed its striking white abdomen moving slowly around its web with a small up and down motion, accompanying a slight twist of the body as it moved. The spider was making its web, an orb web, and the motion I saw was it anchoring the spiral, sticky threads to the “spokes of the wheel” foundation threads (non-sticky) as it circled around and around. I went inside and grabbed my camera, but when I returned, the spider had stopped moving and was obviously feeding on a tiny prey that had blundered into the web in my absence. My first photo was less than satisfying – the black and white pattern and odd shape did not translate very well in my flash photo. 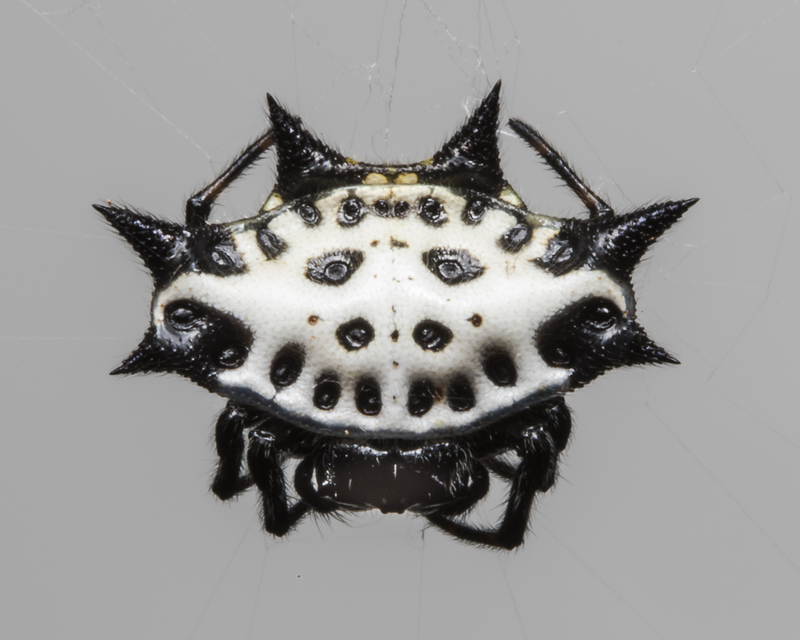 The black spines adorning the spider’s abdomen tended to vanish into the black background created by the flash. So, I went inside and grabbed a piece of white foam core, clamped it to a tripod and set it up behind the spider so the spider was now outlined in a light background color through my viewfinder. I took a few more shots and went back inside to confirm the identification of this odd-looking species. 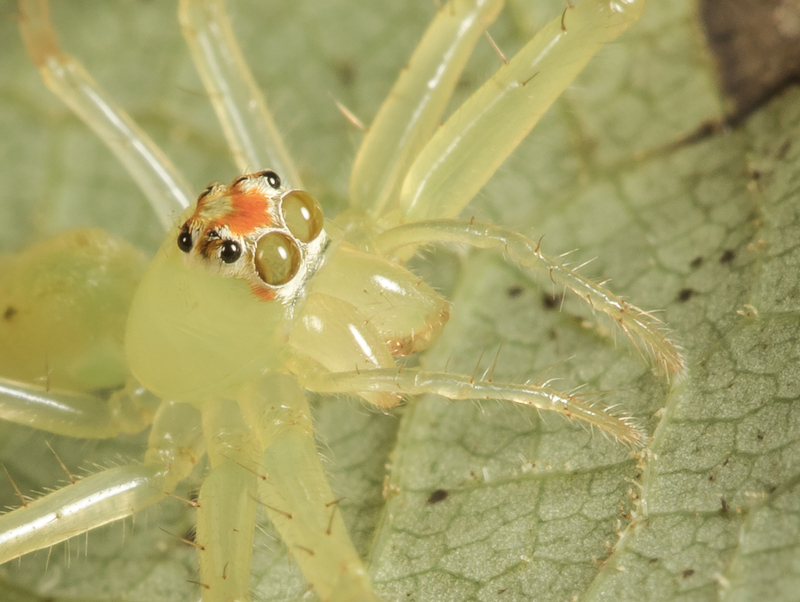 A quick update on a post I did two years ago on a Tale of Two Spiders. A friend had spotted an odd-looking spider that had spun a web on her car. 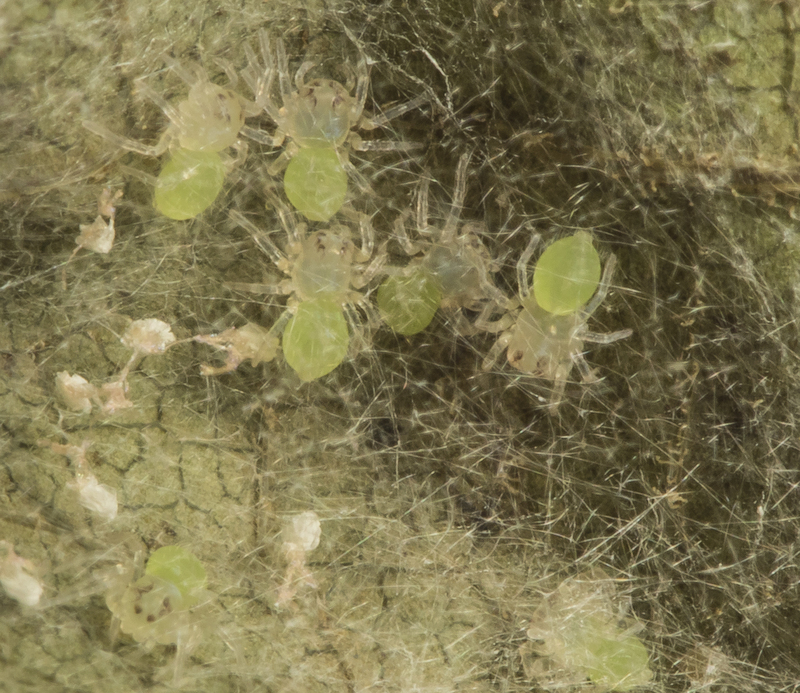 Closer inspection revealed the spider had a hitch-hiker, a parasitic wasp larva. I watched the spider over the next few days until one morning, it was no longer in a web, but was lying on the ground, shriveled and dead. 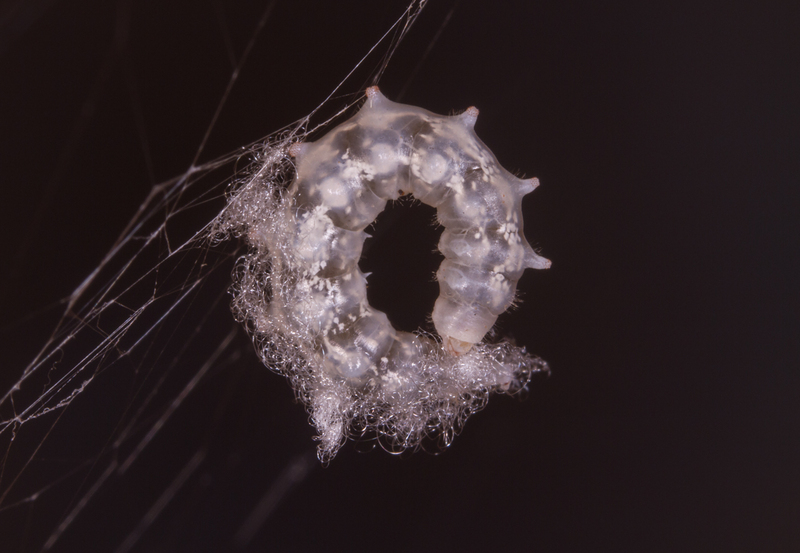 The wasp larva was now much larger and was constructing a cocoon in a small sturdy web that had been made by the spider before its demise. I found references online where scientists speculated that the parasite somehow managed to coerce the spider into making an alternate style web before it was totally drained by the feeding larva. 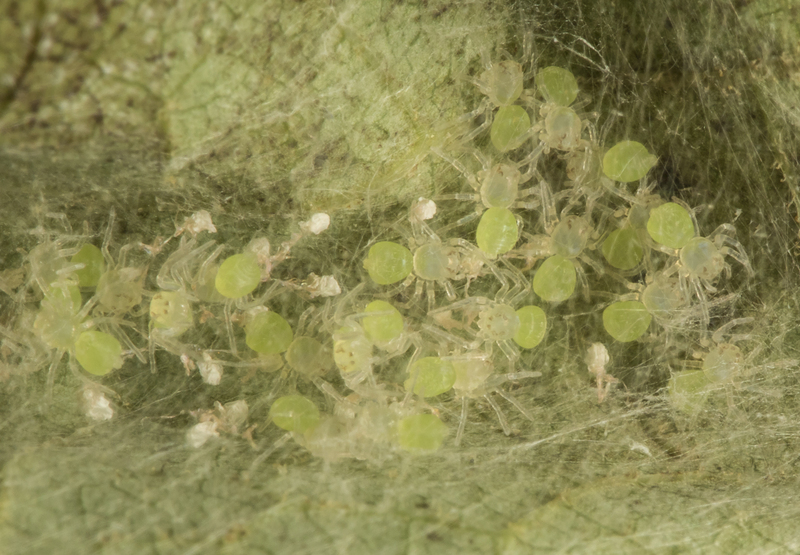 A recent study published in the Journal of Experimental Biology (and reported in the New York Times a little over a week ago) now reveals that these wasp larvae (or at least similar species to the ones I photographed) incapacitate their hapless victims by taking control of their nervous systems and turning them into zombies. How cool is that? 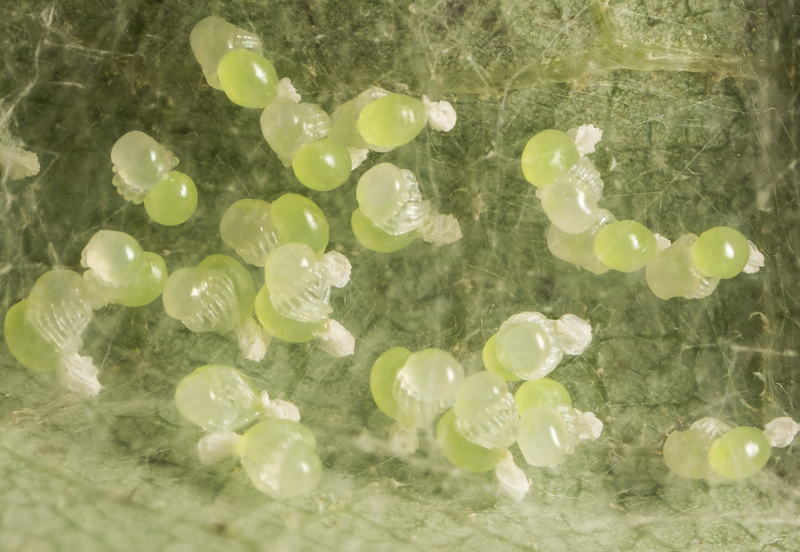 The spider’s final act is to construct a small, tough web that helps support and protect the cocoon spun by the wasp larva as it readies itself to pupate. 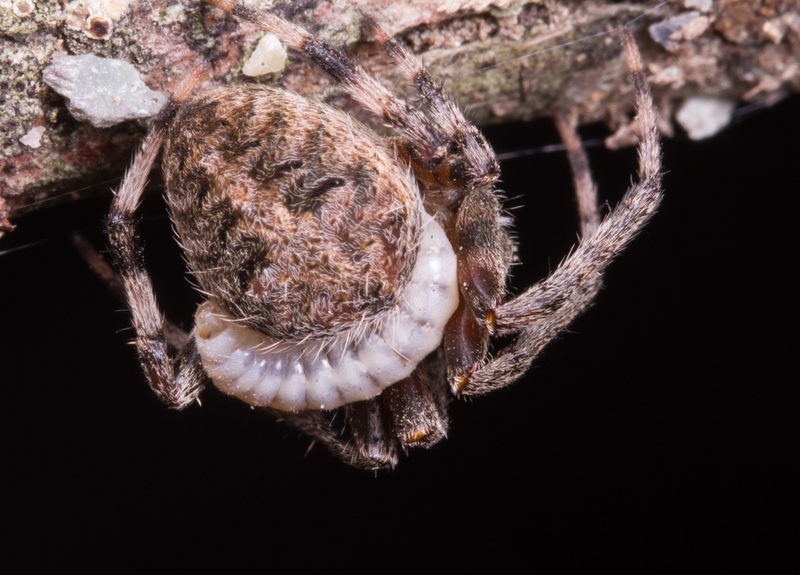 The researchers found that this last web made by the hapless spider was similar to one they make as a resting or molting site web. 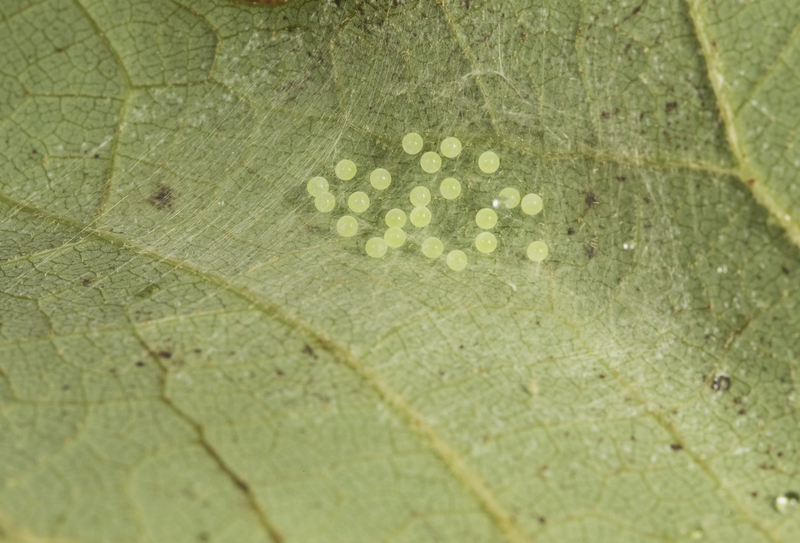 In other words, this design is something already in their web-building repertoire, but the wasp larva hijacks that genetically programmed behavior for its own purpose before killing the spider. 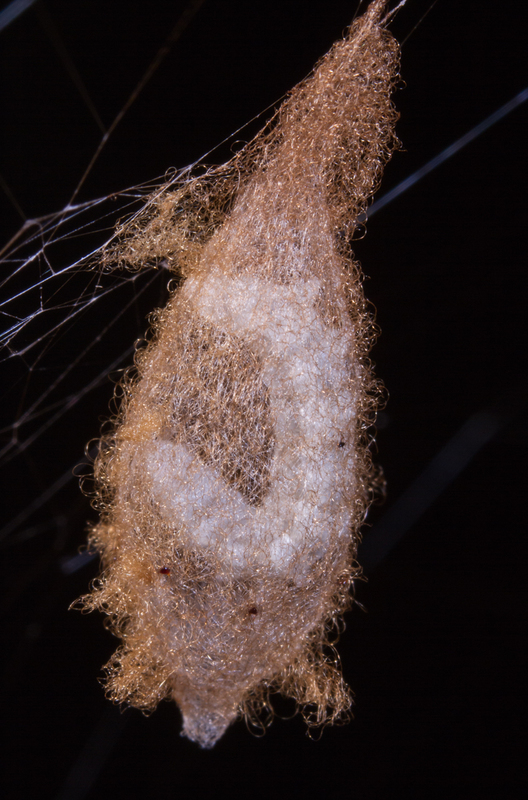 They also found this last cocoon web was a beefed-up version of the resting web usually made by the spider, which means it probably offers even more protection for the master wasp larva. 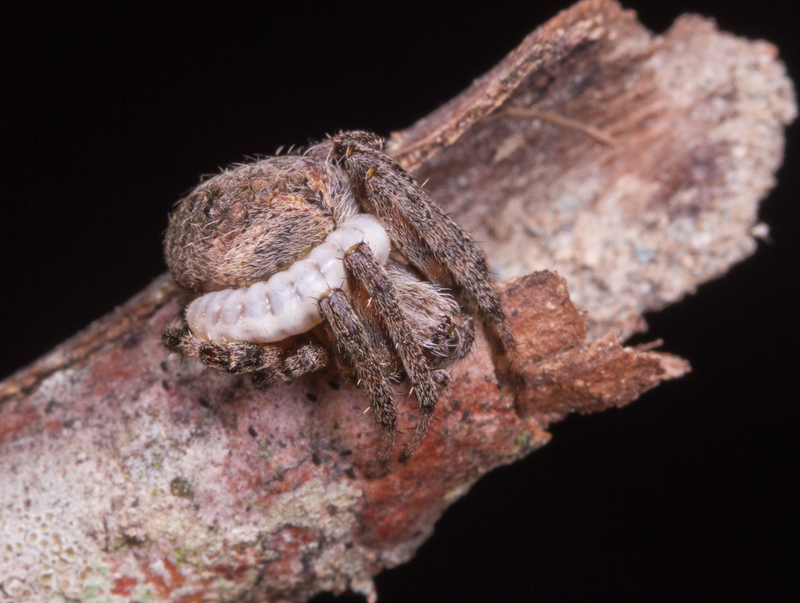 The scientists suspect the spider’s behavior is triggered by a substance similar to the spider’s molting hormone injected into the spider by the larva. Zombies…fact or fiction? You be the judge. Found a large spider shed in my shed this week. Believe it to be from a Dolomedes species (probably D. tenebrosus). This one would have been close to 3 inches across in total leg span! 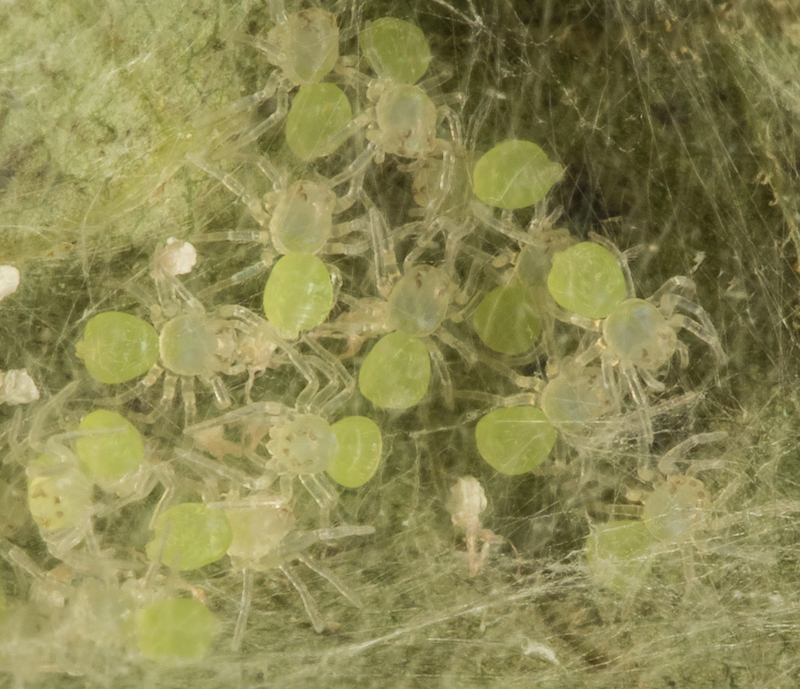 Their group is known as the Fishing Spiders, but this species is often found far from water, as in this case. They are not web-builders, but hunt large insects and other invertebrates by stalking and pouncing, much like a Wolf Spider (more on those in a future post). 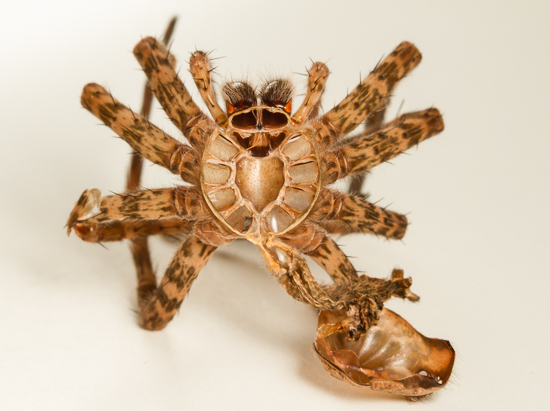 Spiders shed by pumping fluid upward which causes the cephalothorax to rupture and pop open like a lid. They then pull themselves out, leaving their old exoskeleton for shed owners to find and ponder. A close look at the chelicerae makes me appreciate the biting capacity of these large spiders. No wonder they can capture and subdue fairly large insects (I know there are some Wood Roaches and Camel Crickets in the shed). 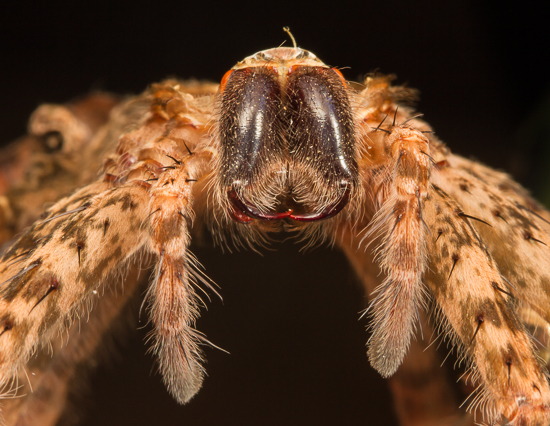 You can see the fangs at the tip of the chelicerae which are used to handle prey and inject venom. On either side of the chelicerae are the pedipalps, which look like short legs. They function as olfactory and sensory organs, and are used to manipulate food. 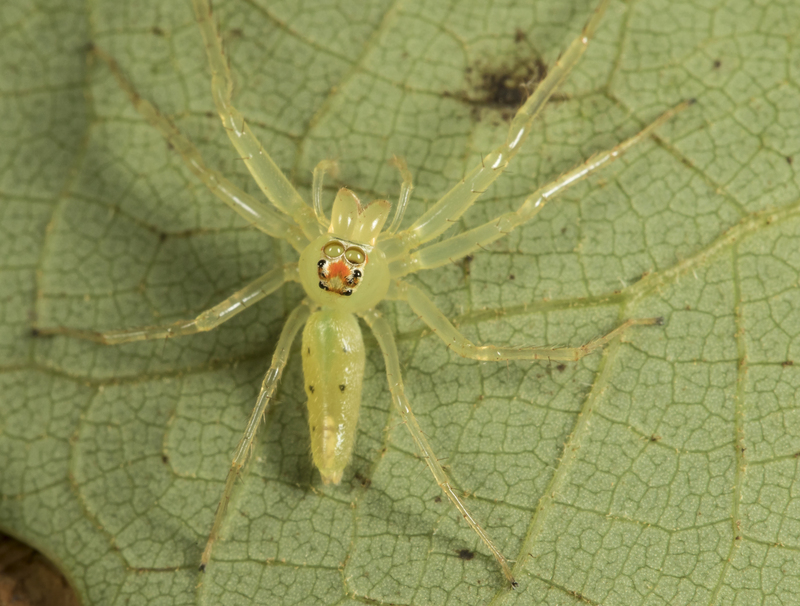 In sexually mature male spiders, they are further modified at the tip to serve as a copulatory organ.